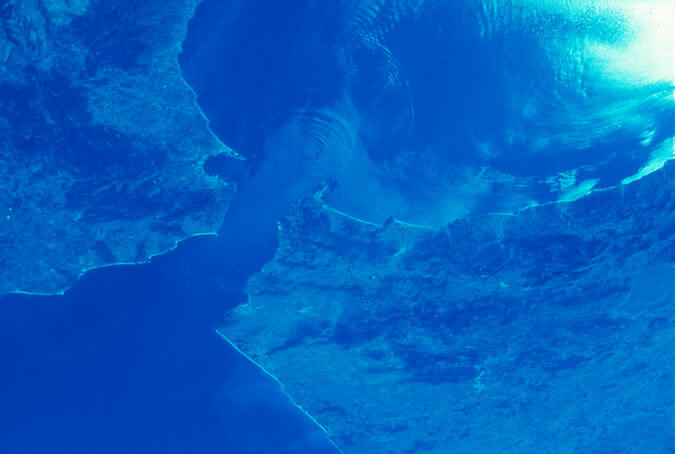 The Strait of Gibraltar is a narrow waterway separating the Atlantic Ocean (bottom left) from the Mediterranean Sea (top right). This 13-kilometer-wide waterway also separates Europe and Africa, with Spain and Gibraltar on the left and Morocco on the right. Until the opening of the Suez Canal in 1869, the Strait of Gibraltar served as the only access point to the Mediterranean Sea. During World War II, naval traffic through this strait was monitored by both Allied and Axis navies, as it served as a crucial “chokepoint” for vessels traveling between the Atlantic and Mediterranean. October 1984, mission STS-41G, image 17-34-81.